Essentially, compliance requirements involve the establishment and implementation of accessibility policies, practices and procedures consistent with the core principles of independence, dignity, integration and equality of opportunity as outlined in the standard and related to: assistive devices, service animals, support persons, communications, temporary service disruption notification, customer service feedback, accessible documentation and notification to ensure you are providing accessible customer service to persons with disabilities. Staff training must include all volunteers, contractors and any other people who interact with the public or other third parties on your behalf and address how to effectively communicate, serve and interact with persons with disabilities. 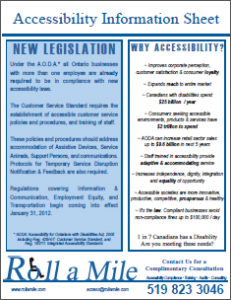 Businesses with twenty or more employees and public sector organizations have additional responsibilities under the AODA.